The Cloverleaf North Condominium is a private gated community nestled between the Halifax River and Atlantic Ocean in Daytona Beach Shores. 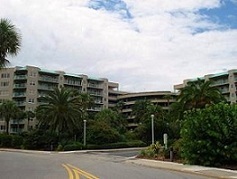 Built in 1994, the complex is located within a short drive from Port Orange and Ponce Inlet. Close to shopping, restaurants, banking, and great schools, this boutique style condominium complex gives you easy access to convenient amenities just minutes from your front door. For their price, Cloverleaf North Condos really deliver top-notch amenities. Units come with a private balcony with river views, a kitchen with breakfast bar, and a spacious dining room. Homeowners at Clover Leaf Condominiums also get access to a designated parking spot which is located just outside each unit. This is possible due to the spiraling parking garage that allows easy access to your vehicle when bringing in broceries or belongings. Residents won't need to wander far to gain access to the day to day services they need. Grocery stores, restaurants, banks, medical facilities, and schools are all close by. Residents are also within a few minutes from local area attractions such as the Halifax Marina, Peabody Auditorium, the Daytona International Speedway, Ponce Inlet, Daytona Lagoon, and Lighthouse Point Park.